Once Google released the SDK for Chromecast, developers everywhere were able to get their hands on the code, and figure out a way to integrate their apps with the streaming dongle. We definitely expected larger applications to bring this service to their users like VUDU is working on, but any developer (large or small) can do so, as shown by the developers behind Solid Explorer. One of the biggest complaints about Chromecast since its release, is the inability to play local media files that you have stored on your device. With a new update, and the help of a plugin, Solid Explorer is going to take care of that for you. Solid Explorer already has a long list of features, including independent panels for easy dragging and dropping, plus every cloud storage option you can think of. 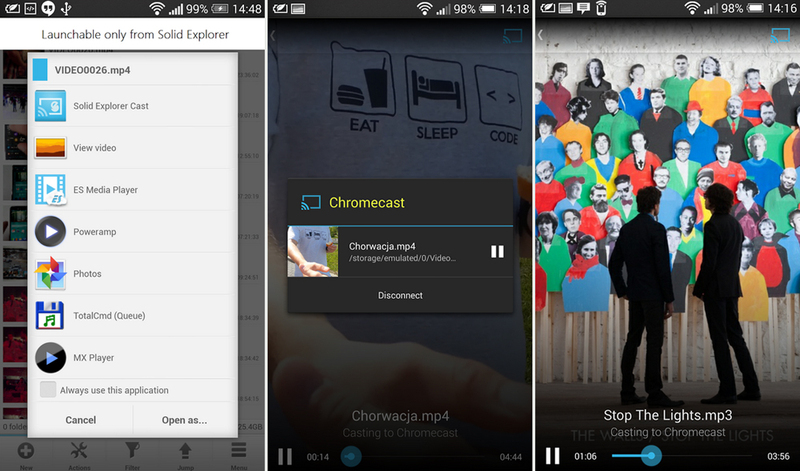 The new Chromecast plugin works alongside Solid Explorer. Once installed, users will click on a type of media that they want to play, select the “Cast” button, and the app will do the rest. There seems to be a few bugs that still need to be worked out, but with the plugin being new, that is to be expected. If you are looking to Chromecast a few of your pet’s videos onto your big screen, check out the Play links below. Yes, the New HTC One Will be Referred to as "The All New HTC One"